It can be hard to defend oneself from the past when you wander the paths of your happy childhood. I'm not much for dwelling on what has been but I believe our pasts are stepping-stones to the future that should not totally be forgotten. As I'm blessed with both a happy childhood and an extremely good memory I once in a while like to indulge in summers of yesterday. I won't bother you with all that comes to my mind every time when I return to my island but I'll put up some photos, both new and old. 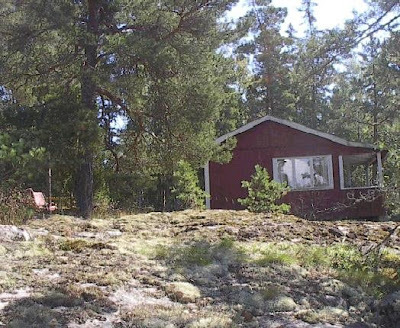 Many years ago as a teenager I had a holiday in Sweden in a cabin in the woods by a lake and though I am sure there are hundreds of such, this looks remarkably like the one I stayed in! 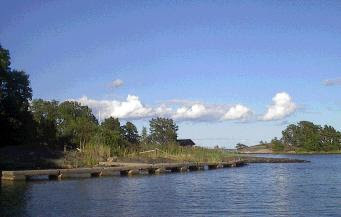 Had a wood burning stove and a jetty with a boat at the bottom of the slope. Oh it was wonderful.